The arch is an important feature of your feet as it bears a lot of weight. When you walk or engage in strenuous exercise, it is the arch that supports the pressure as you move your feet. When any damage is incurred to this area, everyday mobility can become severely impacted. Luckily, some of the best high arch supports available can help you manage the symptoms and discomfort. Do I Need Arch Support for High Arches? The height of the arch is different for every person. It may also change if someone suffers an injury, has a medical condition or simply due to aging naturally. The use of an arch support and using it properly can result in prevention of serious muscle-related problems and even disability. The purpose of a good high arch support is to make sure that you do not feel pain when walking or moving around. Knowing the exact shape of your sole is crucial and there are many ways through which you can figure out your arch. One way is to stand barefoot in front of a mirror. If you are flatfooted, then your foot will rest entirely or almost entirely on the floor. If you have a high arch, you will be able to see it visibly. Another thing you can do is rely on what American Academy of Orthopedic Surgeons suggest. They say that you can dip the bottom of your feet in water and place it on a surface which leaves behind a footprint. Those with flat feet will notice low arches which have a little curve from the toe towards the heel whereas high arched feet will leave behind footprints that have a rather skinny strip. Women who are pregnant will notice that their arch flattens with the pressure of the excess weight. Doctors recommend that pregnant women choose comfortable shoes that offer good absorption. Those with arthritis can develop a curve that is flat which means they need support. As we age our body starts to change and the foot is one body part that is also impacted. Care has to be taken to ensure that no serious conditions arise because of attention not paid to the feet. To support arches both low and high, it is important that foot-wear which fits well is chosen. Whether you are a young athlete or a senior citizen, taking care of arches is crucial. Our focus is mainly on high arch support and it is recommended that all those with high arch support should cushion their shoes. Shoes such as these are curved allowing the foot to roll inward. The benefits of arch support are that it helps reduce or prevent pain. For people who have flat feet, high arch support can be used to enable movement and that too without any pain. High arch provides support to all those who have trouble moving. People may also experience pain because of a poor foundation. Shoes should be comfortable enough to provide maximum support but at times they fail to do so which is why arch supports are used. They only have to be slipped into the shoes and allow people to adjust the fit providing comfort and eradicating pain. Furthermore, arch support provides balance making it easier to walk without losing support. The use of arch support improves overall posture allowing an individual to walk easily. However, there are drawbacks present with arch support one of which is that it is not suitable for use on unequal surfaces. In fact, research states that there is a 12% higher impact on knees with padded shoes in place of barefoot walking. And if you are running, then wearing shoes with cushion tends to make you land on rear foot which is really not very good for shock absorption. For your ease, we have highlighted the best high arch support available on Amazon that can be used to reduce pain and improve mobility. This arch support is designed to provide a balancing support and is also suitable for use by anyone with flat feet as they provide soothing solutions. This product can be used to correct abnormal walking patterns, relieve heel pain and also deals with knee pain. Made from high-quality material that is durable, having these on will make you feel you are walking on clouds. If you wish to improve your physical performance these are a must-have. Climbing, running, games or sports, this product is suitable for all occasions. The inserted arch insoles provide comfort that can last up to hours. The shock absorption makes it easier to reduce muscle fatigue in both legs and feet. 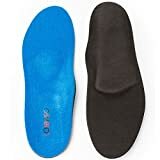 The insoles can be inserted in shoes, sneakers and casual shoes. The product is designed in a way that it provides support for improving foot posture. With these insoles on you are providing stability and comfort necessary for walking properly. This pair of high quality high arch support is 100 % risk-free. Customers who have used the product have found it to fit perfectly. They have stated that the whenever they use this product they are able to walk properly and do not feel stiff. This arch support is suitable for reducing heel pain, foot pain and is even helpful for joint and lower back pain. The arch support provides relief by reducing the pressure on the heels instantly. The use of this product will enable you to walk properly and improve your posture without having to encounter any kind of pain. You will be able to stand tall and feel nice after the use of this product. Made from superior quality material, this arch can be used to improve healing. The product comes in different sizes making it easier for customers to find a product that can fit easily. This product can be used for any kind of shoe, including heels. The company provides a 30-day exchange policy allowing the product to be resized or exchanged. Get your hands on this product to get instant comfort. Customers have said that only in 3 weeks after using this product they didn’t feel any kind of pain. They have stated that it is one of the best products available in the market that provides the required support. Designed specifically for flat fleet, these fine quality high arch supports are designed to deal with conditions such as plantar fasciitis, over-pronation, heel pain, ankle pain and other kinds of foot related discomfort. Made of durable and long-lasting material, this arch support is suitable for use in walking, hiking and running. The material used to make the product is soft and absorbs sweat keeping your feet moisturized. The product can be inserted into different types of shoes such as boots, heels, sneakers and others. The company provides a money back guarantee which means they are confident about the product they are selling. If you wish to get instant relief from pain and want to walk perfectly this product is for you. Customers who have purchased the product have stated that it provides maximum comfort and has a nice arch. In a few weeks’ time, they were able to notice the reduced pain and were able to walk better. They have also added that the overall quality of the product is high and they are able to get the necessary comfort from its use. 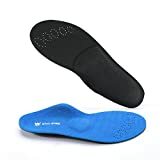 This product is a medical grade orthotic insert that can be used to cure all kind of foot pain such as heel pain, arch pain, ankle pain, and plantar fasciitis. This popular high arch support is perfect for use by all those who have flat feet. It allows the user to evenly distribute the weight thereby improving overall posture. The product provides support to the base and heel of the foot. The orthotic controls the overall movement and the heel cradle allows protection of heels during movement. This product can be used with all types of footwear allowing you to get comfort with style. It is made using a lightweight fabric that does not only allow the sweat to be soaked but also helps keep your foot cooler allowing it to produce a natural moisturizer. The product also prevents feet from odor as it consists of anti-bacterial properties. Customers who have used the product have stated that it fits perfectly and helps reduce pressure on the heels. Further, they have added that it eases down pain helping you walk better and allowing you to feel wonderful. The product provides instant relief and shows results within weeks. This highly recommended high arch support is perfect for dealing with most foot-related problems. 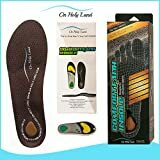 Whether you have heel pain, plantar fasciitis, foot pain, or fatigued feet, this product is suitable for use in dealing with the associated discomfort. Made from high-quality material this product consists of skin-friendly velvet fabric and has a high-density foam allowing you to feel comfortable while walking. This quality product will not make your feet stiff but will provide maximum comfort and even keep the feet cool preventing bad odor. The product comes with elastic features that reduce shocking and prevent damage from taking place. Furthermore, the product is durable and successfully reduces pain and improves overall blood circulation. This high arch support can be used with every kind of footwear. The use of this product will provide necessary stability and comfort that will allow you to feel great. There are ventilation holes present that allows for air to pass in and out. Customers who have used the product have labeled it “Magical” as it allowed them to walk perfectly without any discomfort. They have said that only within a few days the product showed the desired results. This product is suitable for dealing with all kinds of foot pain such as flat feet, plantar fasciitis, ankle sprains, chronic knee pain and back pain. It is also useful in dealing with different feet related conditions that cause excruciating pain making it difficult to walk. Suitable for use by both men and women this product can be used daily and for every kind of activities. It is an overall very comfortable product that helps improve overall posture and enables a user to start walking again. It also comes with anti-bacterial properties allowing protection against bad odor and sweating. This product can also be used during sports events such as hockey, football, aerobics, jogging and others. Customers who have used the product have found it to be super comfortable. They have said that it fits perfectly inside the shoe and can be used in all kind of events. The product’s high quality and effectiveness in dealing with pain have been appreciated by the people. It is among the products with the highest rating and one of the bestselling products. These are some of the best-selling high arch supports available in the market that can be used to reduce foot pain. When you use these with a comfortable shoe, you can get the required cushioning to stand or work on your feet all day long.